I'm in the process of getting my 11 year old daughter set up for shooting, she will be shooting a Ruger Mark IV standard with a Primary Arms MD-ADS, should weigh just over 2 pounds. I will likely start her shooting 2 handed at least this year. I have a nice local match that is all 25 yards and has no turning targets. The match director is easy going but isn't aware of the probationary 2 handed shooting. How does he report her scores? She will only shoot 22 and 2 handed. I know they have classification cards for 22 only but not sure how that works with the probationary 2 handed shooting. Screenshot from from 2016 NRA rulebook, page 56. Not sure if the 25-yd max is an issue or not. Might want to ask ahead of time just to check. That's what I read, it's a bit vague. Do the match directors just report the scores as normal or something special? It sounds like that is a specific match where everyone has the option of 1 or 2 handed. Not sure you can shoot "probationary" in a regular match. Just my reading. That's the problem it "sounds" like things to different people. I have the feeling the NRA pistol committee didn't give any instruction to match directors. As always, it is the match option to provide for Rule 24, it is not required. Same as for .22 only, etc. The match program should specify the details of the matches, courses of fire, distances, conditions, position and divisions allowed, schedule for awards, etc. 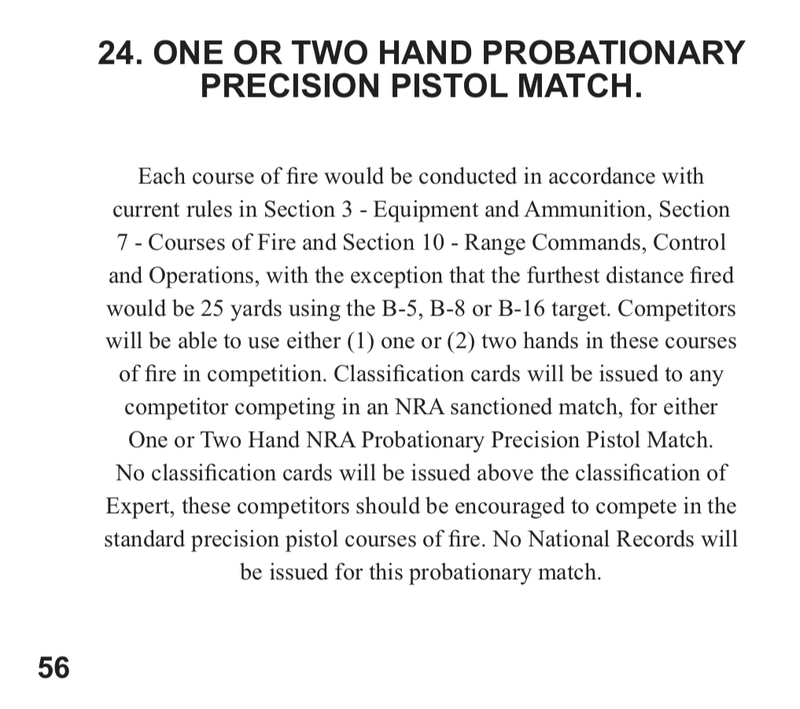 Secondly, classifications do not matter about caliber, only the division (Open / Metallic), match conditions (Indoor / Outdoor) and somewhat for position (rule 5.5 or one hand or 2 hand probationary match although this really does not matter, except it simply sets the limit of classification to Expert. See Rule 24). (c) National Match Gallery Course (50 feet or 20 yards). Scores fired indoors are used to establish indoor classification. Scores fired outdoors are used to establish outdoor classification. season for issue of Official Classification Cards. Scores fired in complete matches over the above courses, regardless of the caliber of arm used will be combined and averaged to establish a competitor’s classification. Anyway, sorry for the long post, but most here are competitors but as a match director I've had a lot of conversations with the NRA over the past 20 years. If the match director has any questions, just send me a PM and I'll try to help.